In July, I had the opportunity to visit Harry Potter The Exhibition at the Museum of Science and Industry in Chicago, Illinois. My husband and preschool-aged daughter excitedly tagged along with me. If you have Harry Potter fans in your family, this exhibit is THE place to visit! Like most Harry Potter fans we've seen all the movies. The amazing thing about this exhibit is that visitors can see in person over 200 props and authentic costumes from the Harry Potter films. Parts of the 10,000-square-foot exhibit feel as if you've set foot right onto a Harry Potter movie set. Alohomora! With this one word (and a special timed-entry ticket), visitors gain entry into Harry Potter The Exhibition. 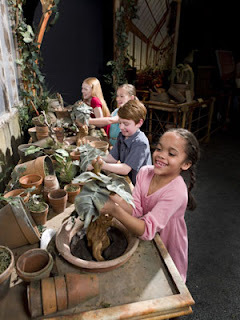 The exhibit has been a popular attraction at the museum since its world premier opening in April and Harry Potter fans can purchase tickets for the Chicago attraction up until it closes on September 27, 2009. Sorting Hat - The walkthrough begins with the sorting hat. A couple lucky people out of our group volunteered to find out in which Hogwarts house they belonged. Pre-Show - After the sorting hat experience, each group enters a movie viewing area and watches a Pre-Show. Clips from various Harry Potter films are shown on eight large screens. (If you have small children, you might want to cover their eyes for parts of the pre-show. Several scary images of Voldemort and other troubling characters flash on the screen.) A train whistle blows and the group proceeds forward, walking by a replica of the Hogwarts Express. Gryffindor Common Room - My daughter loved seeing the moving pictures in the Portrait Gallery and passing by the Fat Lady to enter Gryffindor. 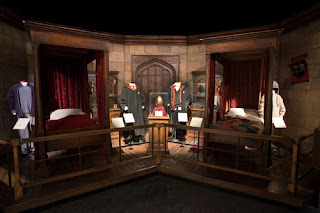 All sorts of costumes and movie artifacts are available to see in this area including: school uniforms, Harry and Ron's dormitory room complete with beds, Harry's glasses and wand, The Time-Turner used by Hermione Granger and the Marauder's Map. The Classrooms - Many instructor artifacts and costumes can be viewed here including: Professor Snape's costumes and potions, Umbridge's ugly pink office, Professor Trelawney's crystal ball (I learned from listening to the audio that some versions are made of rubber not glass). The interactive Mandrakes exhibit is pretty darn neat. The Mandrakes scream when you pull them from their pots. Quidditch - Visitors can play Quidditch by throwing quaffles through the hoops and see many Quidditch costumes and props including the Golden Snitch and the Nimbus 2000 broomstick. Hagrid's Hut - One of my favorite characters is Buckbeak, the Hippogriff, shown in this exhibit outside the hut. What an amazing sight to see all the individual feathers on his large body. Visiting Hagrid's Hut was the highlight of the tour for me. I even sat in his oversized chair! Forbidden Forest - If you like spiders, you'll like the Forbidden forest. Acromantula is displayed here along with life-size centaurs and the Hungarian Horntail dragon. This area even smells forbidden. Dark Forces - Our trip through the Dark Forces was short and sweet. We didn't want our daughter to have bad dreams because she looked at a Dementor or saw Lord Voldemort’s costume and the Death Eaters’ robes and masks. Great Hall - My husband liked the Great Hall the best of all mostly because of the floating candles overhead. He also liked seeing Professor Dumbledore's costume and chuckled when he noticed Dobby the house-elf peering out from behind his robes. Fawkes the phoenix looks splendid as expected. My daughter oohed and aahed at Hermione Granger’s purplish Yule Ball Gown. The feast of turkey and lavish desserts looked good enough to eat! Visitors can buy all sorts of fun things in the special gift shop at the end of the tour. We ended up purchasing a few postcards, a golden snitch, and a fun palm-sized Harry Potter flip-book. I would have loved to purchase a wand or time-turner, but I wasn't willing to fork over $50+ dollars. If you aren't able to make it to Chicago to see Harry Potter The Exhibition, don't worry. The display opens at The Museum of Science in Boston on Oct. 25 and plans are currently underway for other locations. 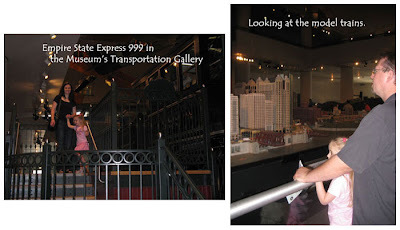 By the way, even though you can't ride on the Hogwarts Express, there are plenty of other train related exhibits in the museum! Great photos of the exhibition. My son would love the Hogwart's Express. I have never read the Harry Potter series or seen the films. When my son is older and gets into Harry, I am assuming he will, I certainly hope this exhibition will still be around. Happy WW and take care. That looks like a fun exhibit! Wow, I never knew they had that!! oh these look great I may have to pop down there this week with the kids! 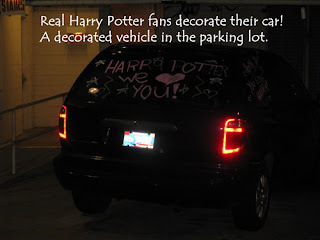 Very cool for the big Harry Potter fans!! WOW! That exhibit is amazing!!! I have no idea about Harry Potter since I have not read the books or watched the movies BUT these exhibits are amazing. What a treat for the fans! That is so cool! It looks and sounds like so much fun!!! Wow....so cool. We are very much looking forward to the new section at "Islands of Adventure" in Orlando! I'm not a HUGE potter fan but my son does like the movies (too young to read yet) and I love that they encourage imagination... That looks like it would be a wonderful exhibit to see.. Thanks for reminding me about this! I've been meaning to bring my kids downtown to check it out. Totally got chills with the idea of seeing the Gryffindor common room and standing in it! Too cool! That exhibition sounds fantastic! All the descriptions of exhibits sounds great and there are so many cool features to it! They need to come closer to the south. I would love to go to it. Oh wow! That is too freakin awesome :D I didn't even know they had that kind of exhibit in Chicago. I would love to go see it now! !